As the fall semester comes to a close, students are prepping for exams and working on final papers before their long-awaited winter break arrives. With the excitement of the holidays around the corner, this time of year also usually means a slowdown in new leases and renewals within the student housing sector. However, what if there was a way to use this season to your advantage via a holiday lease-up campaign that made your leasing numbers look merry and bright? Let’s look at Cyber Monday, for example. The first Monday after Thanksgiving has become the biggest shopping day of the year. Just last year alone, online shoppers spent nearly $7 billion.1 Is it possible for student housing property owners to capitalize on that same momentum? Yes! Marketing campaigns with deadlines have a tremendous impact on leasing, so focusing on a day such as Cyber Monday that’s well known for special deals not only serves as a great attention grabber, it also adds urgency to sign or renew to lock in one-day-only deals. Our award-winning marketing partner, Catalyst, specializes in real estate marketing for student housing and higher education. Four years ago, they developed an integrated campaign for Cyber Monday that has given student housing property owners an opportunity to experience some jolly leasing joy. Each year, this campaign has gained significant traction at properties throughout the Campus Advantage portfolio, serving as the last big push to sign residents for the following year during the fall semester and before prospects leave for winter break. The campaign is used to market student housing properties to students (18- to 24-year-olds) in more than 30 markets around the United States, and last year’s campaign was the most successful to date. Lindsay Brown, Vice President of Leasing for Campus Advantage, says that historically, there is a major decrease in leasing over the holidays, but with the avenue of digital marketing via the Cyber Monday campaign, there’s an opportunity to reach students and parents while they’re together. This is particularly beneficial because the parent/guarantor plays a large role in the housing decision. 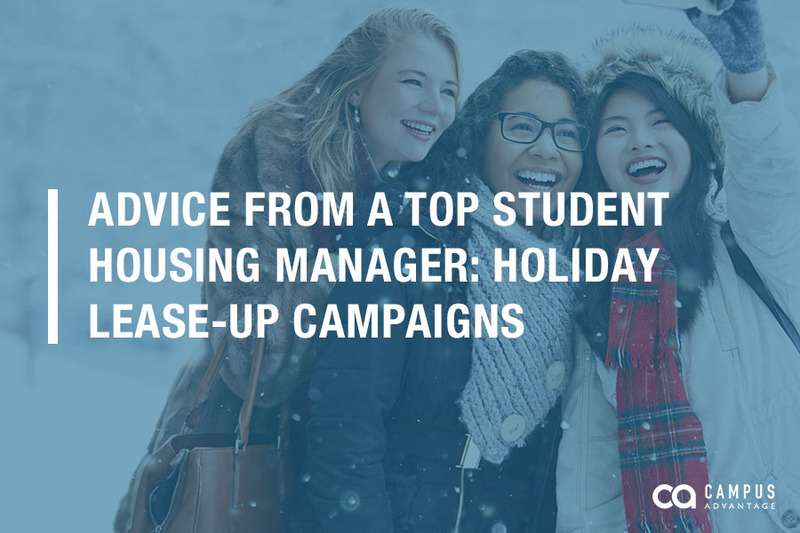 According to top student housing managers in the market, when it comes to the campaign’s messaging, a good tip is to gear it toward the family environment and speak to parents as well as the students, yet also be aggressive in the incentive offered in order to lock in the lease by the deadline. While this theme specifically called out unique facts and figures about CA properties, it was universal enough to be used by all properties within the portfolio. In addition to theme development, Catalyst also created a video, various social media graphics, emails and associated landing pages, thank you cards, posters, and flyers that allowed each property to tease Cyber Monday specials leading up to November 27, 2017. Each participating property established the special deal they wanted to offer residents and prospects, which ranged anywhere from discounted rates to various prizes based on their individual budgets. More than 176,000 emails were sent to 71,847 unique recipients with an average open rate of 32.52% and a click-through rate of 6.26%. In total, this campaign generated 2,640 signed leases across the portfolio.